Marshmallow wars, 2012. Photo by Annie Lane. As we glide into the Fourth of July, we will soon be immersed in some ol’ American traditions: protests, fireworks and marshmallow fights. And in OB, all of these are truly accentuated – here, let me explain. Take the fireworks for instance. Well, they were almost “taken” – remember the legal challenges to neighborhood and downtown fireworks by a local environmental group? July 4th, 2012. Photo by Annie Lane. July 4th fireworks in OB and in other coastal towns were threatened when the Coastal Environmental Rights Foundations sued La Jolla for its fireworks permits. The group believes that fireworks need to be reviewed under the stringent California Environmental Quality Act (CEQA) as they threaten the wildlife, marine environment and do other harm. One of the managers of the group is Marco Gonzalez – a well known San Diego County environmentalist – and brother of newly elected State Assemblywoman Lorena Gonzales. But a potential compromise is in the works that would exempt such one-time a year events from CEQA. It’s a new bill that directs the governor to put together clear guidelines for temporary, minor-use special events being exempt from state law requiring often expensive, environmental assessments as a condition of some local permits. We were never quite clear why the lawsuit proceeded against the community of La Jolla for its once-a-year event when the daily fireworks displays that SeaWorld puts on during the Summer months were not addressed. SeaWorld’s fireworks do much more harm and damage than La Jolla’s or OB’s for that matter. At any rate, the Fourth Fireworks will go on. Yes, the protest is not in OB, but OBceans will be attending. It’s a rally and march that begins at the fountain in Balboa Park calling to Restore the Fourth Amendment to the US Constitution and a protest of the government surveillance and spying on citizens. Protests in over 100 cities across America have been planned. All will demand demand an end to the unconstitutional surveillance methods employed by the U.S. government and to ensure that all future government surveillance is constitutional, limited, and clearly defined. They also will demand that the government adhere to its constitutionally dictated limits and respect the Fourth Amendment, which clearly protects all citizens’ assets, both digital and physical, against searches and seizures without warrant. What’s a Fourth of July celebrating our rights without a protest against those rights being taken away. Get over to Balboa Park. The rally and march should be over by 1 pm, with plenty of time to get back to the beach for the celebrations and the marshmallow wars. Has OB’s infamous marshmallow fight gone beyond the limits? Do you know who started the very first one? What can we say – as it’s all been said before. Here’s a series of reports, stories and posts from years past about our fascination with those round, soft and gooey clumps of sugar. Who Started the First OB Marshmallow Fight? I plan to stay far away from the festivities this year, safely ensconced in my house. 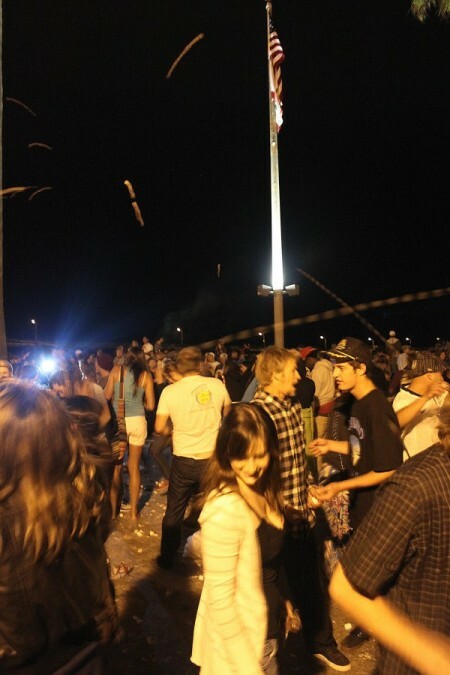 Last year, it was a chaotic scene leaving the beach area after the fireworks. I generally feel pretty safe walking around OB, but that night I did not. The police allowed people to set off illegal fireworks all over the parks and streets all night (one landed within a few feet of me and my infant child) and told me later the event was a huge success because there were “no major incidents” which is apparently the standard now. I never got a straight answer as to why the police weren’t citing people for setting off fireworks in plain view of their watch tower but I think their lack of proactive policing sets the stage for chaos. Now, by proactive, I don’t mean to encourage things like stopping and frisking people for no reason or searching coolers for banned substances or outfitting themselves in riot gear or tanks, but if an officer sees someone setting off fireworks, they should walk over and write up a ticket for a huge fine. How hard is that? It wouldn’t take many citations to put a stop to it. No police state required. The Sea World fireworks are a menace to the community. How in the world have they been allowed to go on all these years? I’m sure the whales don’t care for them either. For the record, I love fireworks. Specifically, the really big, special occasion kind expected on the Fourth of July. I just don’t like the illegal street kind that blind and maim people or the nightly menace kind that kinda of spoil what’s special about fireworks: rarity. I hear you. My girlfriend got nailed by an egg at the beach right as the marshmallow fight began. People have no sense of respect and it only gets worse each year. Now it’s all over Newport. At the risk of sounding like the fun police…This is the one OB “ritual?” That I truly do not care for. The majority of people participating are disrespectful and the attitude turns almost violent. People throwing things at each other is hardly ever a good idea. I’m sure this tradition started out as fun and lighthearted, but it’s just turned into a big burden on the community. I may feel differently if 1/10th of the people out there making a mess showed up the next morning to help clean it up. Not to mention, marshmallows are made out of ground up pig skins, bovine hides and other animal bones. So just remember that ladies, as you spend the night washing that crap out of your hair. Remind folks of the clean up on July 5th organized by Surfrider. Thank you for your approach to the fireworks history. Keep in mind, this is 1/4 mile from the Ecological Reserve and Marine Protected Area. We still think La Jolla Cove is an inappropriate location and that all fireworks displays over water should comply with applicable pollution laws. That’s fantastic, that’s what we hopped for, using the Plaza de Panama for public gatherings, political rally’s, celebrations, etc. It’s becoming a real public Plaza just like other great cities. If you have questions about fireworks fights, please just contact us and we’ll be more than happy to answer questions and ensure the facts in your story are accurate. 1. The OB fireworks show is currently illegal. The City has lost all three lawsuits brought by CERF, which means that the City is supposed to review the environmental impacts of the show before issuing permits. Because the matter is up on appeal, we’ve decided to hold off on stopping any of the shows until they are resolved — though folks should know that this is our choice, and not mandated by any law or other party. 2. 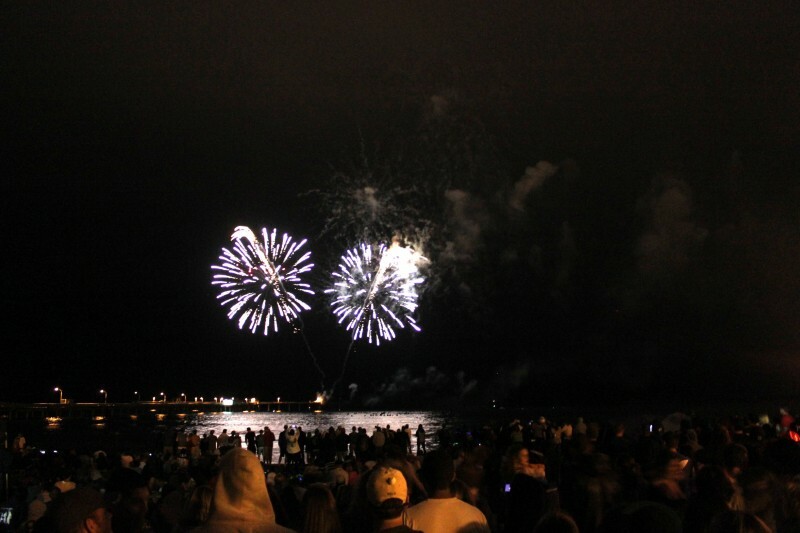 The potential “compromise” that is in the works at the state level will not likely affect fireworks, as the guidelines will be developed for events that will clearly not have impacts on the environment. The evidence is overwhelming that fireworks shows do indeed cause impacts. 3. The reason CERF focused on La Jolla was because they are the most egregious of the illegal discharges. The area surrounding La Jolla is subject to very strict regulations, contains highly protected species, and the organizers of that show have shown a total disdain for the law (in other words, they’re a bunch of liars). You wonder about Sea World, but the reason they aren’t caught up in this particular fight is because we already forced them to get permits for their shows. That fight started in 2001 and culminated in the first-ever Clean Water Act NPDES permit in 2007. That effort then resulted in the Regional Water Board permit for all shows over water in 2011. That permit requirement is on appeal to the State Water Board, and once resolved, will likely result in similar regulations throughout the state. Sea World doesn’t need a City of SD special event permit for its shows, so they aren’t relevant to our current three suits. Marco, has the city paid the $756k bill that you submitted for attorney fees? No, they haven’t. And just to be clear, that fee motion was for just one case. We’ve now won three. The bill will be substantially higher if the City doesn’t come to its senses and work out a reasonable settlement. Thanks, Marco. Does Sea World having a permit mean its show doesn’t adversely affect water quality or marine life? I don’t know much about the process. Just an annoyed/concerned citizen. Are they doing something that mitigates the impact? I think they are a nuisance primarily because of the obscene noise they make nightly all summer, but am also concerned about the impact of so many fireworks being discharged on the environment. One of the requirements of the permit was that Sea World do water quality monitoring. This was an important part of the process to us as we did not have very much hard data on impacts ten years ago. Now that they’ve done a couple of rounds of monitoring, we have more information to use to hold them accountable the next time their permit or their master plan are up for renewal. Also, we’ve now got the wildlife agencies looking at the Least Tern and Snowy Plover nesting and foraging sites that are being impacted from these coastal shows. Unfortunately, change does not happen overnight. The other problem we have is that Mission Bay is already so polluted from years of neglect, urban runoff, sewage spills, and other Sea World discharges, that it’s hard to identify just how much of that is coming from the fireworks. It’s a lame excuse, but we’re doing what we can to push the science. Nonetheless, we’re committed to decreasing the number of Sea World shows when the legal avenue to do so is available. So as long as SeaWorld has its permit, it can get away with the noise, nuisance, harm and damage to marine life and its own animals on a nightly basis during the summer months – a permit that environmentalists have signed off on – nice. Sorry I don’t go for it. Why can’t you see the huge diff between once a year in OB and the many numerous fireworks displays that SeaWorld sets off? It can’t be because SeaWorld has saddled up to San Diego Coastkeeper and now is “partners” with environmentalists? There are so many problems with SeaWorld – even though they do rescue and care for wayward sealife, such as sea lions – that their fireworks are only one aspect. Frank – I totally agree with you. But as noted in my reply to Catherine above, we’re fighting these on numerous fronts. Back in 2001 we were successful in getting the number of shows reduced by about a third, but the science just wasn’t there at the time to shut them down further. (By the way, we fought hard and lost over the construction of the Atlantis ride, and it’s so much worse than was represented to the Coastal Commission back then – drives me nuts ever time I drive by). As I mentioned in my first note above, we have appealed the Clean Water Act permit that Sea World is now covered under, and hope that when the State Water Board finally takes it up, they agree to limit the number of allowed shows further. For the record, I detest Sea World, and no amount of animal rescue will make up for the way they treat animals in captivity or how they act in the political arena. Regarding their apparent greenwashing relationship with Coastkeeper, honestly, it makes me kind of sick to my stomach. One of the reasons we formed CERF was because our former allies (including Surfrider and Coastkeeper) were no longer willing to fight the publicly controversial issues, like fireworks and desalination. Thanks for getting back and keeping the issues alive. Don’t get me started about SeaWorld – see, here is an issue that we clearly agree on – let’s stay focused on that and send us anything you have. What has become of you Ocean Beach? Your filthy, splotched sidewalks and streets. Your marshmallow blobs of sand. Your cigarette butts and plastic bags.